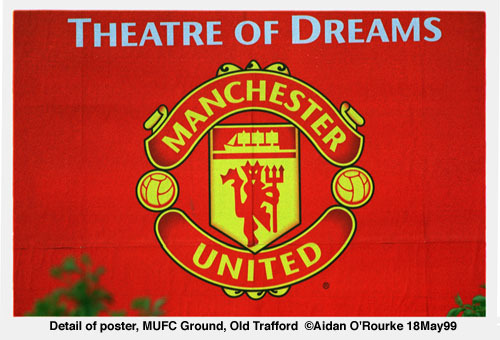 Dear Aidan, I'm now residing in Perth Western Australia .I moved here in 1981 from Manchester.I have settled here and have a buisness and family.I still follow the soccer religiously, and my fav team is Man Utd. I'm starting to collect memorobilia of United and already have a few bits and pieces.If any of you readers have anything to do with Man Utd then I would be grateful if you could donate it to this collection. Any postage costs will be gratefully refunded. When the collection becomes big enough , then it will be available for public viewing. Any interested bits and pieces can be sent to Mr.G. M.Hargreaves P.o. box 626 Como Perth Western Australia. Thank you for your time in reading this message.Your friend Gareth. I hope you have success with your collection! I'm an American who lived in Manchester for about eight years, starting in 1990. I very much miss the place, and I often wonder why I left. I do come back to the city twice a year to teach at the University, so at least I feel a bit connected. I just came across the section of your web site on the buses of Greater Manchester. To give you an idea of how small the world has become, my son, Ben, takes a school bus to primary school every day, and it is run by an outfit called First Student. The parent company is, you guessed it, First Bus. Bus companies are international nowadays - Stagecoach operates in many different countries. Up till the creation of SELNEC in the early 1970's, bus services in Manchester and district were operated by the local authorities such as Manchester Corporation. Since privatisation in 1986, private companies have taken over the running of local services. Yes, it's a small world! As you know, I follow the redevelopment of Manchester with great interest, but it can be difficult from so many thousands of miles away. If you don't mind, I have some questions about the status of specific projects in the city centre. First, the Great Northern development. Can you briefly tell me what they're planning along the Deansgate frontage? Is it to be retail? Telephone House: Good riddance to it. Has it been demolished yet? No, it's still there, though I notice some shrouding has appeared on it - I'll keep you posted. I can tell you one building that has started to come down - It's the former Eagle Star House (right hand picture). Sitting on the podium of Piccadilly Plaza, it's one of the few distinctive and eyecatching post-war structures in Manchester, due to its unusual roof. It's being removed as part of an external make-over job being carried out on Piccadilly Plaza (completed 1965). Eyewitness says: Either restore Piccadilly Plaza to its original state or demolish the whole lot. 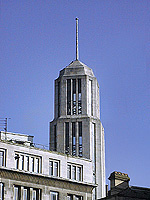 Spinningfields: Any word on Northcliffe House? Has it been demolished yet? Piccadilly Station: Has the office tower been re-clad yet? Finally, Whitworth St: I understand the the large, open-air car park at the junction with Princess St is to be developed into an office/apartment/leisure building. Is this underway yet? It is still a car park - I took a photograph from there recently. That space will be filled very soon, I'm sure. I've just come across something which would seem to indicate the new Free Trade Hall hotel was indeed approved in November of last year - is that so, or is it still awaiting final approval? And: Concerning the Arndale Centre, do you have any idea of the planned completion of the winter garden and the Market St facade renovation? Winter Garden? Facade renovation? This all seems a long way off - the much publicised redevelopment of the Arndale Centre has only been carried out along the Cross Street, Corporation Street facade. The rest of it remains the eyesore that it is. This is how Cannon St looked the other day. 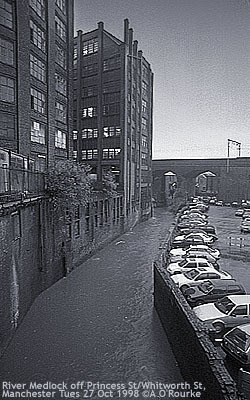 Can you advise of any internet sites that will give information / pictures of this area before the Castlefield development began. 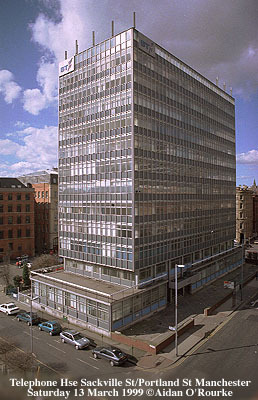 My wife was born in former railway house on Lower Byrom St in 1949 and is trying to find archive pictures of the area. Thanking you in anticipation. For archive pictures you need to consult the Local Studies Unit of the Central Library. They will almost certainly have the picture you are looking for. However you will need to go along in person - their collection is not available via the Internet. Aidan When did they do away with the Bus Station? If my memory serves me correctly, wasn't it the main station for the old North Western Bus Lines, I know that I used to get a bus in Derby and Nottingham, (when I was in the R.A.F. in the 50's/60's) to come back to Manchester. There was also a Night Club on the side street (beside the Station) that connects to Oxford Road. (cannot remember the name of the street/road) The Club was quite well known in those days. As I have mentioned to you before, I have lived in the States now for 30 years and your reports about Manchester bring back some enjoyable memories. On my occasional visits to the UK, I try to look up some of the places you mention and some of the old places I knew (not many left now) Keep up the good work, I know from your readers letters that there are a very large number of Mancunians living abroad who also enjoy your reports. The bus station was moved to Chorlton St in the early seventies - I don't know the exact year. The name of the street is Great Bridgewater Street, which continues into Chepstow Street. I'm too young to remember the club next to the bus station. Can anyone help? Yes, it was a major hub for North Western buses, but other companies operated from there too. Enjoyed your trip down the canal. I left Manchester in Oct 1952 on the Manchester Progress to Canada. What happened to the boat's? I often think of the people who sailed with me. I was alone with my baby of 5 months and dog. What wonderful treatment l had. Would like to hear from anyone who did this trip.It was to Halifax and then to St Johns. The seaway had not opened then so had to take the train to Toronto from St Johns. Sadly, the freighters which used to use the Manchester Ship Canal were superseded by the giant container ships and super tankers of today. A small number of ships still use the canal - I saw one a couple of weeks ago making its way past Barton Bridge. 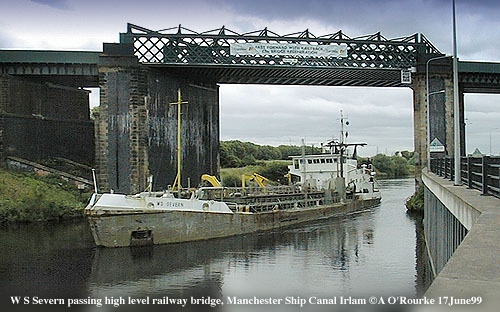 The days of the Ship Canal as a major shipping artery are long gone. I don't know, was it "A Taste of Honey"? The answer to my question was, "Rattle of a Simple Man" starring Harry H Corbert, Michael Medwin, Dianne Cilento and a couple of others I can't remember the names of. It is about a group of Northern football fans off to London for the cup match. After the game they end up in a club in Soho. Michael Medwin, a Jack the Lad, tries to get off with a high class prostitute and fails. Harry, a bit of a mothers boy and slow on the uptake, thinks she is an upper class lady, not realising her "Profession" and takes on MM's bet to bed her. It's a classic. A taste of Honey may have featured LMS but A Kind of Loving was filmed mainly around Oldham. Do you remember the name of the cafe next to the Britons Protection around the 60's? No, I'm too young to remember that! Yes Aidan, I remember it vividly. It's where I caught the No. 6 Glossop Bus (Limited Stop) Which went along Ashton New Rd through Bradford,Clayton, Denton, Ashton, Stalybridge Mottram, and on to Glossop. It was a good bus to ride because, being limited stop, it would get you home in half the time. Hi Aidan, Living so far away from my roots, I didn't even know that the bus station was no longer there. When I was a kid during the war there were still North Western buses leaving from there, and I had many a free ride because my older sister - who passed away in Bispham, Blackpool - was a clippie on those buses. On a few occasions she would slip me a ticket if an inspector came aboard! 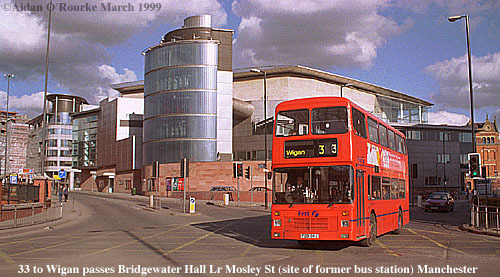 If my memory serves me right, you could even catch a London bus from Lower Mosley St. bus station. Ah! memories. 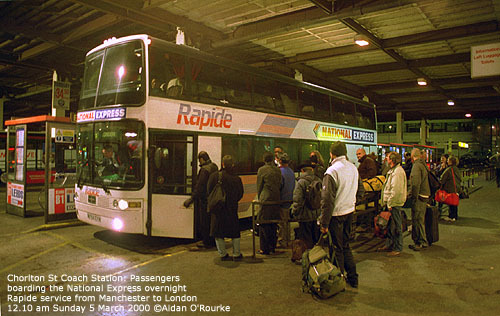 Catching the overnight London bus, operated by North Western, from Lower Mosley St bus station is one of my most vivid memories of trave from my childhood. The station was strikingly white - white exterior tiles and steel railings painted white - this reminded me of Blackpool and holiday times. The bus was a Leyland Leopard - I loved the beautifully crafted leopard insignia on the radiator. The bus had curved skylights above the main windows, allowing you to see the moon as it drove down through the Midlands on its way to the M1 and London. The engine was quite loud, but the vibration put you to sleep. I remember listening to Elton John's 'Madman Across the Water' on my Sinclair matchbox-sized radio - this would place the journey about 1971 - shortly before the bus station closed. It was exciting to wake up the next morning in London. I've taken the same journey in recent times from the depressing Chorlton St coach station (left)- not quite as exciting as it was when I was a child, but I still enjoy it. Your memories are my day to day reality - I was in Didsbury this evening meeting my friends from the film Daddy Fox. 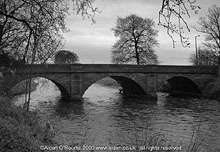 I often drive across Cheadle bridge (left) and occasionally walk along the river bank. I also walked along the river as a child. I went to the Galleon outdoor swimming pool, now replaced by a very popular hotel and fitness centre. I'm sorry I haven't got anything on the old Collyhurst flats. Can anyone out there help? Yes, the mystery footbridge crosses the former railway from Collyhurst to Barney's Tip, also known as Barney's Croft. Here is another set of mystery steps, not too far away. Can you recognise them? I found your website today. I lived in Stockport for 1 year, and I used to go to Manchester at the weekend. I love Manchester, but as I live in Japan, people don't know very much about Manchester. I miss Manchester a lot. I am very glad that you like Manchester. Would you like to join the Eyewitness in Manchester mailing list? Where in Japan do you live? Yes, would love to join the mailing list for Eyewitness in Manchester. I love it. 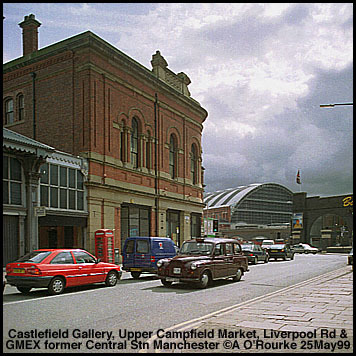 I saw the feature with Questions today, and your photos took me back to Manchester and Stockport. I was chuffed. Bramall Hall Park is my favourite park. On A6 where St. James church is, that's the place I used to walk to Stockport centre and so on. I am so happy to find your www site. Please keep working on it. I am looking forward to seeing future updates. I have to excuse my poor English, as you know I am a Japanese. I am studying English little by little. I hope that you can understand me. Regarding your question, where I live. I live in Fukuoka,it is in south of Japan.it is near Nagasaki,I assume you know Nagasaki by the bomb. 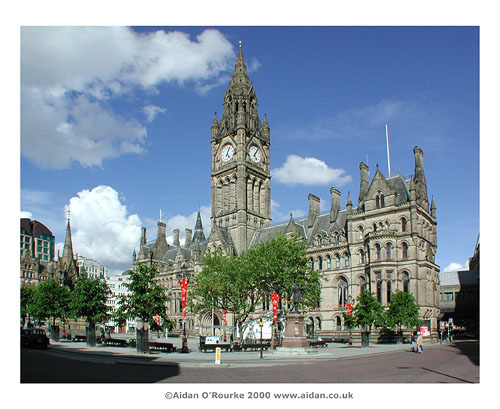 Well my home town is such a beautiful city, but I love Manchester. I can not explain the reason well. I'm very glad that you enjoyed your stay here, and that my photographs help to take you back to Manchester. I once met a girl from Fukuoka on a trip in China. The only place I've visited in Japan was the town of Narita, not far from the airport. I would love to go back to Japan again and photograph it. Thank you very much for your messages. "SUCH A WAVE OF THEFTS from gas meters is taking place that unlucky householders are paying out £3000 to make good the losses. There are 20 cases of gas meter theft in Manchester per week. Black spots are Chorlton-on-Medlock, Hulme, Longsight and Cheetham. A favourite method of the meter thief is to remove the street grating and climb into the cellar. 'The approach of Christmas usually means a glut of thefts' said an official. 'Recently we installed an automatic meter in a shop and within three hours it had been robbed. " Aidan Woke up this morning to your new pages. You are like a fine wine, getting both better & stronger with age. Loved all of it, no exceptions. My special read, was M/c fifty years ago & the "20 cases of gas meters theft" some in my old neighborhood. Can I confess after all these years, that's the reason I had to leave !!! Pray tell me, who was my competitor, or in brief, "WHO GOT THOSE LAST FIVE"
Of course, by summarising selected items from the 1950 MEN, I am just dabbling in the past, trying to recreate an impression of what it was like in 1950 when my father was the same age as me (he was born in 1908). I didn't arrive till 1958. I remember putting a shilling in the gas meter, and the grate round the side of the house where the coal was delivered. I still enjoy making a coal fire when I visit my sister's house in Snowdonia, though the gas meter is now a thing of the past. Aidan, You have outdone yourself!Three cups of tea later, I still have not finished looking at all the pictures. I kept losing the site and had to commence from #1 several times. Words can not express my thanks for wonderful pictures and editorials. It was with very mixed feelings that I viewed the changes in Manchester. I am open to change, but I hardly recognise Manchester or can bring myself to correlate the people I knew with the happenings that have occurred. I think I would rather keep my what I now realise is a totally gone forever rememberance of bygone days. It should help me to finally get over that longing for the England I knew. It makes me very very sad, as I know that times go forward, not backward. 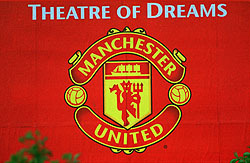 My very best wishes to you and yours for the coming years and a big hello to Manchester. May she arise from the ashes!!! Manchester has become alienated from itself, partly through all the changes - By that I mean that the city it was before all the changes started around 60 years ago has been largely forgotten, due to the huge amount of redevelopment. What people don't realise is that though the present development is generally positive, it isn't always the best possible development, and many things have been lost. I will develop this theme in a future feature. The Ship Canal Cruise was fantastic. One of the best trips I've ever done. Mr Lackey - He wasn't one of my class teachers, but I remember him! 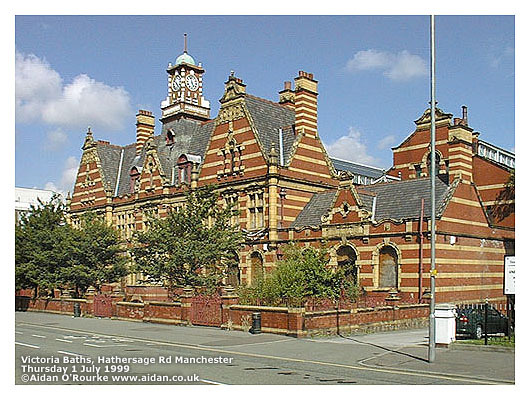 High Street Baths are set to reopen in the next couple of years thanks to the efforts of the Victoria Baths Trust and the Friends of the Victoria Baths. Can you tell me anything further about the statue in Manchester of Oliver Heywood? Which Oliver was he? I am descended from the Heywood's and I believe he is in our family tree. My GGrandfather was a brother to Arthur Heywood, the last private owner of the Liverpool Heywood's Bank. Oliver Heywood lived in Manchester during the 19th century and was a reformer and benefactor to the city. 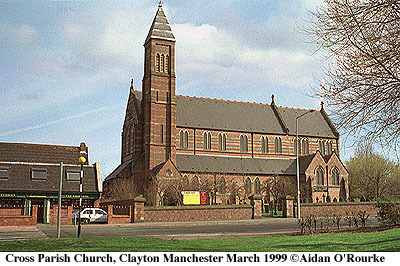 He undertook a lot of charitable work for the people of Manchester, particularly in the area of education. His contribution to the city was recognised in a statue which was put up in Albert Square in 1894. To find out about his family tree you'd have to do further research - Is there anyone out there who can help? Dear Mr O'Rourke, Greetings from far away Australia. I came across your web page "Eyewitness in Manchester" and I notice that much of your work involves the history of your city. I was hoping you might have something in your archives that could help me. I have been researching my family history and I have found that my maternal great grandparents came from Openshaw about 1882. James Monks was born in 1856 in Websters Buildings, Openshaw. Emily Monks nee Hibbert was born in 1860 in Grimshaws Buildings, Openshaw. They married in 1877 in Christ Church in Bradford-Berwick parish. From the 1881 census I have found that there were also Hibberts at 137 & 270 South St; 4 Brunswick St; 21 Brunswick St; 4 Davies St; 13 Forton St; 257 Youth St; 15 Electo St; & Richardsons Buildings. What I am hoping is that you might be able to tell me where Websters; Grimshaws & Richardsons buildings are (or were) and perhaps you have photos of these places or, if nothing, then what might a typical house and street of that era look like. Perhaps you may have stories in your archives that would suggest why people of that era would suddenly leave family, friends and country for the great unknown. I'm sorry, my knowledge of local history isn't as detailed as this - you need either to consult a local historian specialising in that area, or go to the Local Studies Unit at the Central Library. As Balgo is more than a couple of bus rides from the centre of Manchester, this would be a bit difficult! Is there anyone out there who can help?